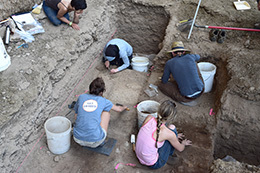 Prehistoric human populations of hunter-gatherers in the region that is now Wyoming and Colorado grew at the same rate as farming societies in Europe, according to a new radiocarbon analysis involving University of Wyoming researchers. The findings challenge the commonly held view that the advent of agriculture 10,000-12,000 years ago accelerated human population growth. The research is reported this week in the Proceedings of the National Academy of Sciences (PNAS), a major scientific journal. The paper’s lead author is Jabran Zahid of the Harvard-Smithsonian Center for Astrophysics in Cambridge, Mass. Erick Robinson, a postdoctoral researcher in UW’s Department of Anthropology, also participated in the research. For humans in the Wyoming and Colorado region between 6,000 and 13,000 years ago -- people who foraged on animals and plants to survive -- the analysis showed a long-term annual growth rate of 0.041 percent, consistent with growth that took place throughout North America. During that same period, European societies were farming or transitioning to agriculture, yet the growth rate there was essentially the same.